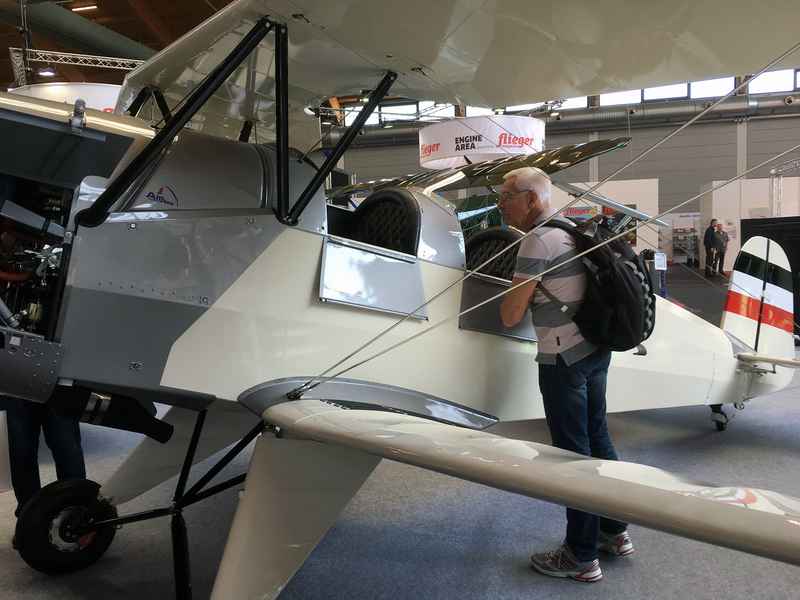 The main event in the Old World for people in aviation is the annual gathering on the shores of Lake Constance in the south German Burg of Friedrichshafen. It’s called simply AERO and is the one European show all about all facets of aviation. AERO gathers the continents’s boldest and the brightest, and if aviation is resolute in reaching people, ordinary people who dream, here they can discover and enjoy flying from its base to its boundaries of speed and attitude. At any aviation event these days, whether focused on commercial flight, showcasing military hardware, or exhibiting the best of recreational flying, one is likely to find vintage aircraft and the mother of all collectible aircraft, Warbirds. These standouts add an indispensable vigor to the ambiance of being or knowing a pilot. AERO invariably obliges in putting these once volitant veterans in the spotlight. Held since 2002 at Messe Friedrichshafen (see blockquote), AERO has showcased the exhibits of hundreds of airplane manufacturers and multitudes of suppliers. The show has become an essential stopover for aviators on the Old World side of the Atlantic. While not alone, and vigorously attempting to keep pace with big events such as AirVenture and Sun ‘n Fun, there are stores of vintage aircraft and warbirds to be seen at AERO if one keeps their compass pointed and calibrated. Messe Friedrichshafen is a stylistically and functionally modern airport-based expo center. It offers a charming ambience amid profuse natural lighting. The indoor exhibit space is large, accommodating events over 900,000 square feet—on par with a show the size of NBAA’s annual convention. 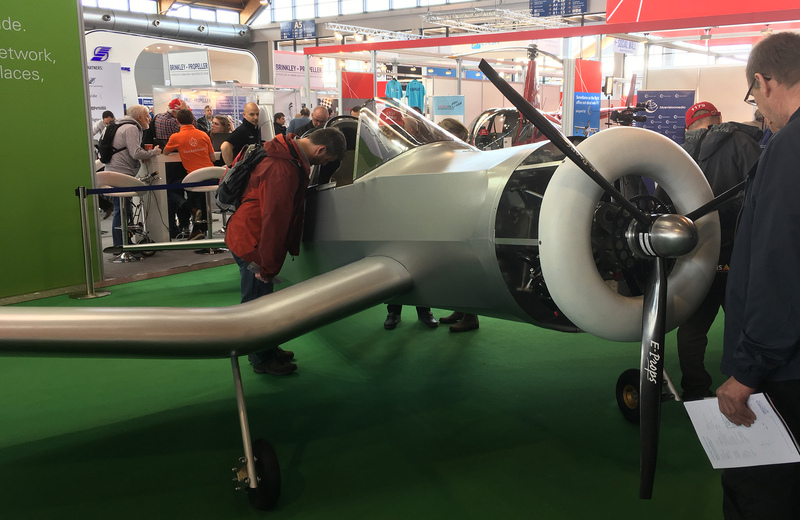 While the 12 grand halls of Messe are divided among categories of aircraft, finding vintage aircraft and warbirds at AERO is surprisingly simple. They stand out. This is after all why we love them. Before chronicling the warbirds spotted at prior AERO shows, it’s important to remember that here in the Old World, Germany in particular, is where aviation’s greatest expansion took place—one charged with innovation and development. Aviation literally took off and accelerated, in large part, on the WWI and WWII stages of Europe. It then played out worldwide on a massive scale. 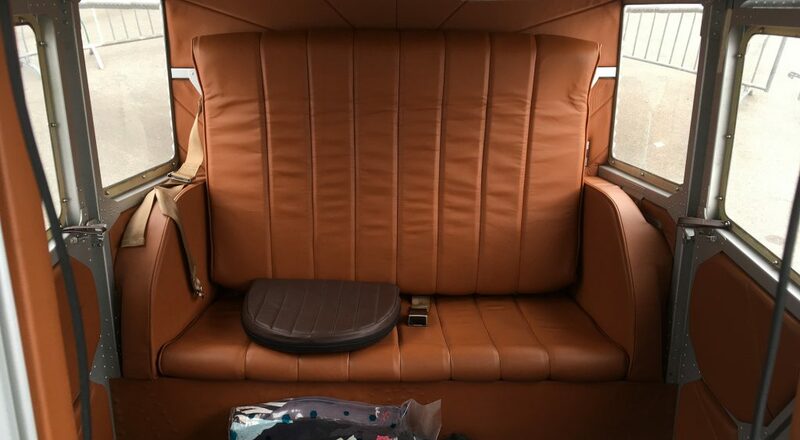 On the experimental side of European aircraft design, several manufacturers have introduced relic aircraft as offerings in the unbelievably slight ultralight class. For example, the UL-39 Albi, JH Corsair, and Stampe SV4-RS each borrow from the namesake and likeness of their predecessors. The recreations are astounding and each of these builds drew steady crowds at AERO. A typical AERO show designates four or more halls of the event to the rapidly growing segment of aviation in Europe that includes Ultralight (UL, called microlight in some countries), Very Light Aircraft (VLA), and Light Sport Aeroplanes (LSA, the European equivalent to America’s Light-Sport Aircraft). Here again is where much of the innovation in European aviation is taking place. It is happening due to simpler licensing requirements. The light aircraft pilot community is henceforth growing decidedly faster than the private pilot licensing (PPL) segment. And within this class—where pilots still dream—one finds a fascination for vintage aircraft, warbirds and their replicas. The Aero L-39 Albatros is a military jet trainer still being built today in the Czech Republic by Aero Vodochody. It dates back to the 1960s when Czechoslovakia still existed, under communist rule. The Albatros is said to be the most widely used jet trainer in the world. In addition to serving as a basic and advanced pilot training platform, it has flown in light-attack combat missions. Despite a number of notable crashes, the L-39 remains popular among collectors. Many former military specimens have been sold publicly. Specialized flight schools offer training in the jet. Since 2004, the Defense/MRO Division of Aero Vodochody performs demilitarization of these aircraft, supports civil registration and certification, offers life extension programs, crew training, logistics, inspections and other expertise. In contrast, or perhaps sameness, the UL-39 Albi is a svelte carbon-composite clone with a non-conventional “jet-drive” powerplant. Albi is offered by SkyLeader Aircraft also of the Czech Republic. The aircraft’s BMW S1000RR engine is a power bike derivative whereby a reciprocating internal combustion engine drives a fan. Thus equipped, the UL-39 flies with around 193 hp (142 kW). A completely new airplane concept, conceived by the Department of Aerospace Engineering at the Czech Technical University Prague, proposes to offer the properties of a jet airplane in the ultralight category. The UL-39 Albi is offered by SkyLeader Aircraft of the Czech Republic. Construction of the UL-39 is compliant to CS-VLA (an EASA Certification Specification for Very Light Aircraft). 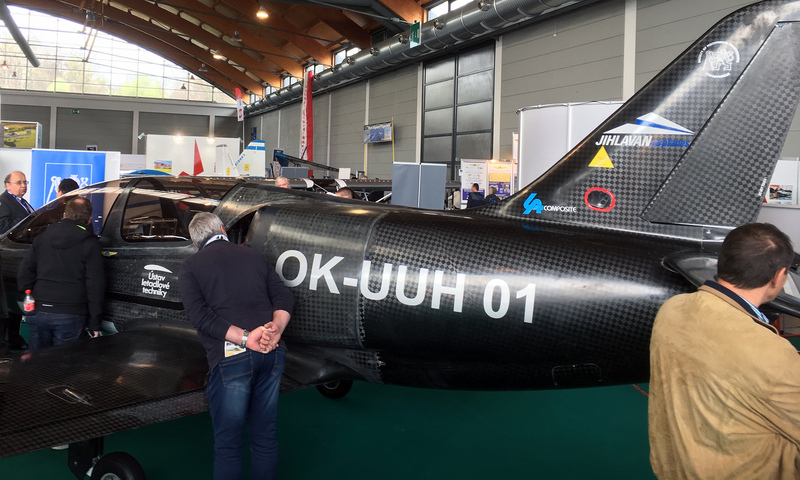 According to Radek Filip of SkyLeader, “The UL-39 Albi is a longtime project. One prototype was built three years ago. At this time, we are developing a second prototype with a better engine and modification of the fuselage and wings. V(ne) will be more than 350 km/h [189 knots] and cruise speed will be around 320 km/h [173 knots].” Expectations are for the aircraft to be finished in 2020, and the airplane ready for sale. Another warbird replica in the ultralight class is the JH Corsair by JH Aircraft. It offers an example of experimenting in lightweight construction with recognizable styling on the exterior. In outward appearance, this aircraft resembles the Vought F4U Corsair, an American fighter aircraft that saw service primarily in World War II and the Korean War. Original F4U Corsairs were in high demand following their debut. They were built by three different manufacturers over an 11-year run, the longest production run of any piston-engine fighter aircraft in U.S. history. More than 12,500 examples of the F4U were built, comprising 16 separate variants. Countries operating the Corsair included Argentina, El Salvador, France, Honduras, New Zealand, the United Kingdom and the United States. An estimated 45 F4U aircraft are now privately owned in the U.S. The JH Corsair is offered by JH Aircraft of Germany. Today’s JH Corsair complies with the SSDR (Single Seat De-Regulated) microlight initiative in the UK and the FAA’s FAR Part 103 ultralight class. Target design weight is an unbelievably low 254 lbs. (120 kg.) empty. During the Second World War, Stampe et Vertongen built the SV.4 as a trainer and touring airplane. However, only 35 of were built before the company was closed. After the war, a further 65 aircraft were built as trainers for the Belgian Air Force. Later, under license, the SV.4C was built in France and French Algeria where a combined total of 940 aircraft were completed. It was widely used by French military units as a primary trainer and many SV.4 examples served in French aero clubs then later sold in the UK and other countries. Today, the highly prized SV.4 is available in replica form as the Stampe SV4-RS. Working off original drawings to maintain a 1:1 airframe scale, the Stampe SV4-RS was developed from scratch by Ultralight Concept of Belgium. The SV4-RS is significantly lighter at 290 kg, versus 560 kg previously. Four engine options are offered. Approvals of the SV4-RS have been granted in Belgium, Germany and France with six aircraft presently flying. 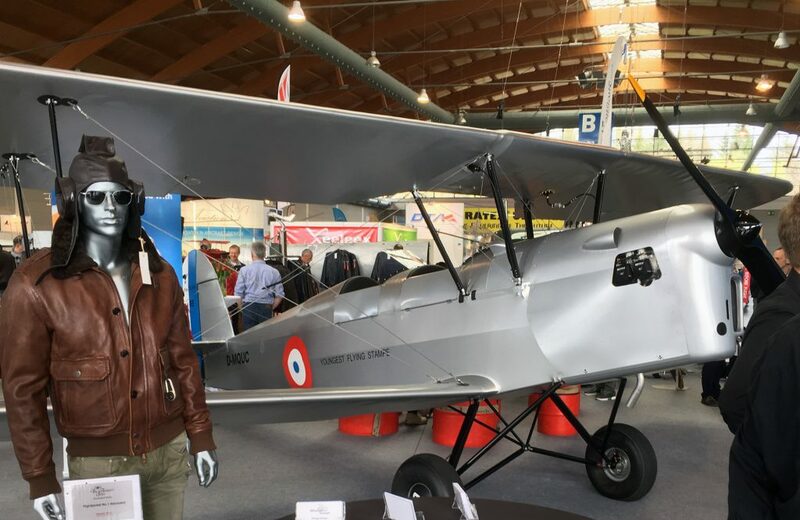 The Stampe SV4-RS is offered by Ultralight Concept of Belgium. 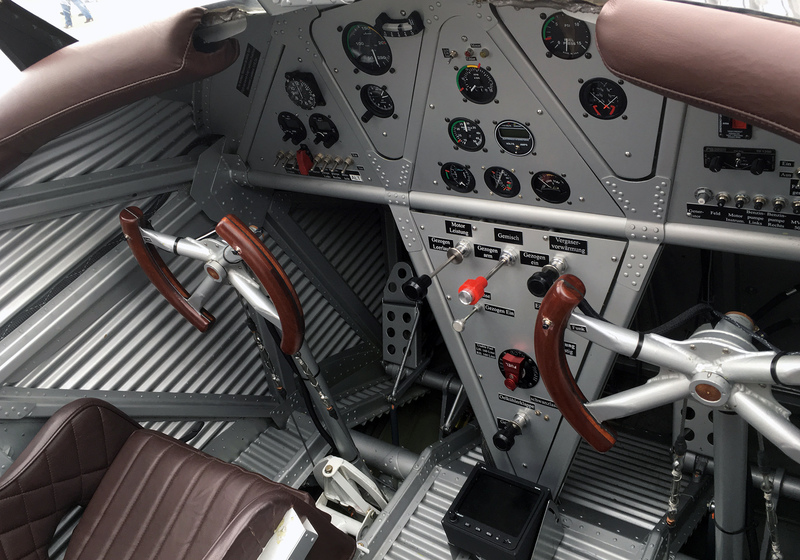 If a true warbird is what one treasures, at least one firm is producing replicas for the nostalgia-minded private pilot. The original Bücker Bü 131 Jungmann served as a basic trainer in Germany and first flew in April 1934. The all new T-131 PA Jungmann is being built today by parts supplier Air Res Aviation of Poland. It is intended as a recreational flivver, and a bonus logbook entry for those who perform training in it. The T-131 PA Jungmann is offered by Air Res Aviation of Poland. The Bü 131 Jungmann was used by the Luftwaffe during World War II. Sturdy and agile, it was first delivered to the Deutscher Luftsportverband (German Air Sports Association) and operated in nearly all the Luftwaffe’s primary flying schools. Production licenses were granted to Switzerland, Spain, Hungary, Czechoslovakia and Japan. Current owners and pilots prize the Bü 131 for its outstanding handling characteristics when compared to other antique biplanes and even more modern aerobatic types. 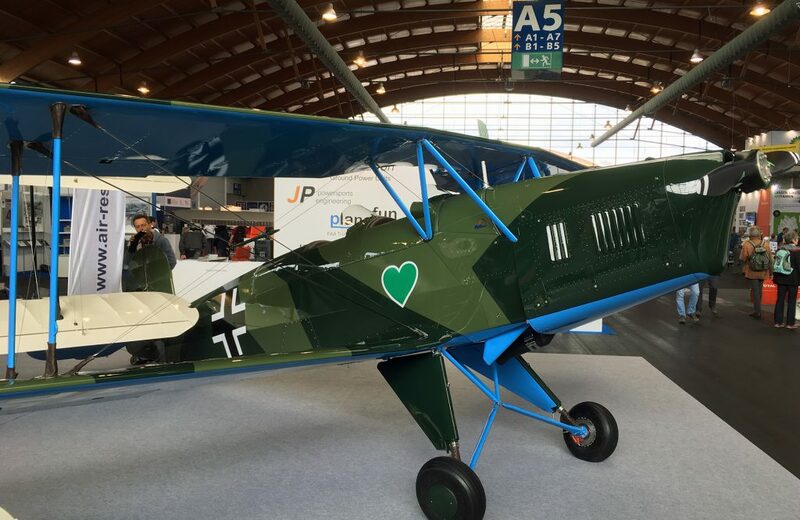 Promoting their T-131 Jungmann, Air Res Aviation brought its “brand new aircraft with historical origin” to AERO in 2017. The company built two replicas from scratch using original technical drawings and documentation from 1937. 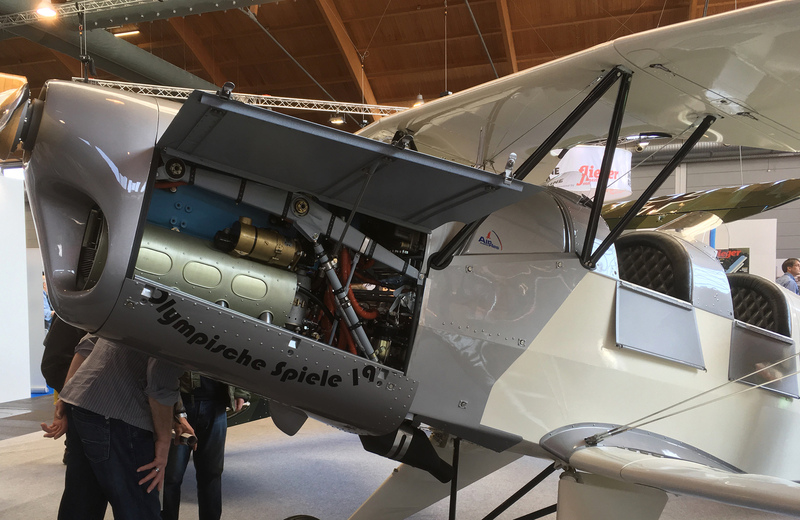 According to Michał Malinowski of Air Res, “A few elements have been changed to achieve better performance.” The T-131 Jungmann is available as a kit on the company’s website with a selection of engines and a variety of options. M332AK engine by LOM in the T-131 Jungmann. While today’s trade shows are populated with replicas and remans of warbirds, one can also find true gems of aviation history. 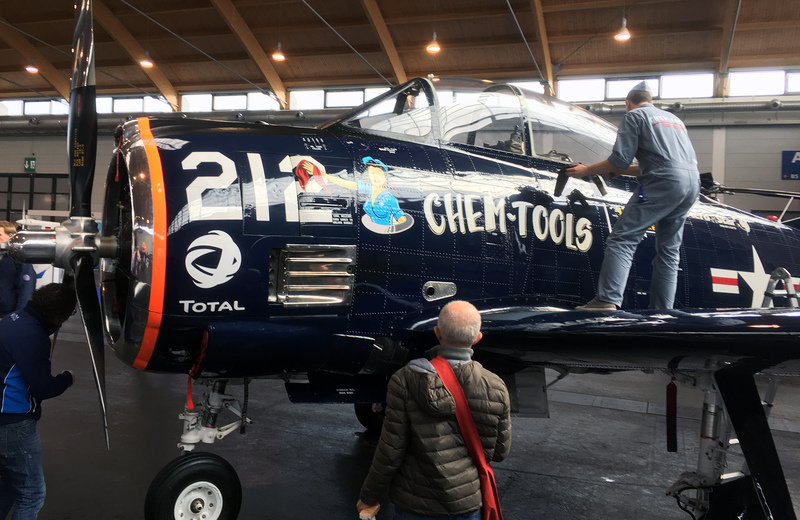 Chem-Tools, a German maker of cleaning products for cars, airplanes, motorcycles and boats, had its branded T-28B Trojan at AERO. The T-28 Trojan exhibited by Chem-Tools a German maker of cleaning products for vehicles of all types. The North American Aviation T-28 Trojan is a piston-engine military trainer aircraft used by the United States Air Force and United States Navy beginning in the 1950s. Besides being used as a trainer, the T-28 was employed as a counter-insurgency aircraft, primarily during the Vietnam War. Though first adopted by the U.S. Air Force, the Navy, Marine Corps and Coast Guard also used these aircraft well into the early 1980s. The North American Aviation T-28 Trojan has endured in civilian use as an aerobatics and warbird performer. Many T-28 examples are on display throughout the world. In addition, a considerable number exist in private ownership. Sometimes warbirds and vintage aircraft only feign authenticity. Modern construction and lightweight materials have given way to bulletproof designs of the past. These new warbirds subsist on inspiration and the predisposition of their predecessors. The Viper SD-4 is one such example. A two-seat microlight and LSA from Tomark of the Slovak Republic (the other half of the former Czechoslovakia), this aircraft looks conspicuously a lot like a great number of other modern constructions. However, the Viper SD-4 is all-metal while many similar looking aircraft are constructed of polymer and fiber composites. The Viper SD-4 is sleek, and painted in gray it resembles a warbird. With a single propeller, it’s being positioned as warbird trainer. The Viper SD-4 is offered by Tomark of the Slovak Republic. The Blackshape Prime and Gabriel are offered by Blackshape of Italy. The Blackshape models derived from a Giuseppe Vidor design, the Asso X Jewel. Originally a wood concept aircraft, it later surfaced as the Millennium Master, a carbon fiber product of the University of Turin’s Department of Aerostructures. While the BK 100 Prime is marketed in Italy and other parts of Europe, in the U.S. it appears as the Tarragon (as reported by Kitplanes magazine), yet another design variation by CFM Air of Italy and Pelegrin of Latvia. The Pelegrin Tarragon is offered by Pelegrin of Latvia. AERO takes place mostly inside the halls and courtyards of Messe. While adjacent to Bodensee-Airport Friedrichshafen (IATA code FDH), the airfield is generally limited to arrivals and departures during the show. Though access remains closed, one may find warbirds alongside the active taxiway Bravo and even vintage aircraft in the camping area situated on the airfield. This differs greatly from the general openness of Lakeland Linder Field during Sun ‘n Fun or Wittman Regional Airport during AirVenture Oshkosh. Despite the separation between exhibition center and airfield, flying in in one’s own plane is very practical and growing in popularity. 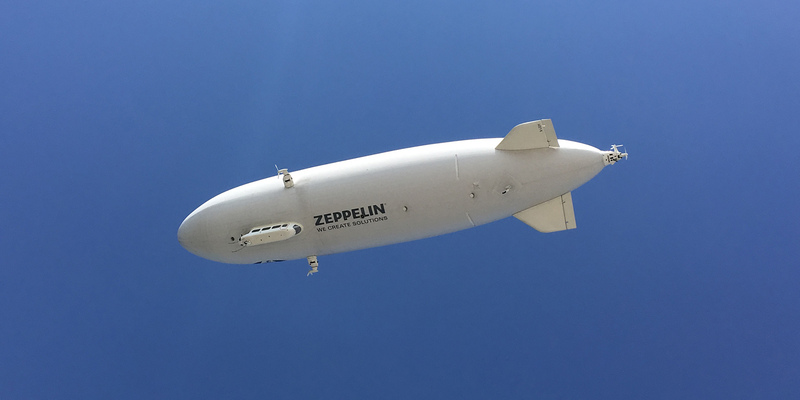 The Zeppelin is a timeless aircraft that seems locked in its origins. It’s an aircraft that never fully developed a purpose despite the grand expectations it promised. Today it is a spectacle, an observation platform for ground gawkers and patrons who ride in it. Housed in a large hangar at the airfield’s center, the Zeppelin makes frequent roundtrips allowing passengers a unique tour of the neighboring Alpine region. Flights range from half an hour to two hours with fares priced from €215 to €810. A requisite sojourn during deployment at AERO is a visit the outstanding aviation-themed, the Zeppelin Museum situated on the waterfront of Lake Constance. The museum is located in a repurposed Bauhaus-era train station building. It houses a collection and chronicled history of, you guessed it, Zeppelin airships. It’s a large space featuring a walk-in section of an airship. The waterfront setting, historic building and exhibits contained within are a thumbs-up and should appeal to all visitors. Count Zeppelin, as he is commonly referred to, was Ferdinand Adolf Heinrich August Graf von Zeppelin, a German general and later aircraft manufacturer. He was a scion (descendant) of a noble family, hence bearing title of “Count.” His story along with stories of his airships are fascinating. Perhaps this is especially true given that these great aircraft are generally relegated as things of a past era. The flying Zeppelin resides in the itular hangar next to Messe on the airfield. There, it was accompanied at a gala event at the start of AERO 2017 by another vintage empress, the Rimowa-Junkers F13. These two remarkable aircraft reinforce the grandeur of airships and full-metal aircraft representing innovation and development in aviation. Despite the luxury of abundant indoor space, some exhibitors set up outdoors at AERO. The first Rimowa-Junkers F13, produced by luggage maker Rimowa, was positioned between Messe and the Zeppelin hangar. This newly constructed F13 is a meticulously accurate replica of the 1920s all metal German passenger aircraft. Historically fascinating, the F13 project was launched after the Armistice of Compiègne in 1918. The idea was to construct a passenger airplane to link countries peacefully, thereby precluding any possibility of future war. Fledgling airlines worldwide adopted it. The F13 succeeded in reducing long distances and production went on for 14 years. Rimowa continues the tradition of peacemaker today both with the F13 replica and its line of suitcase products which resemble the corrugated wing and fuselage skins of the aircraft. 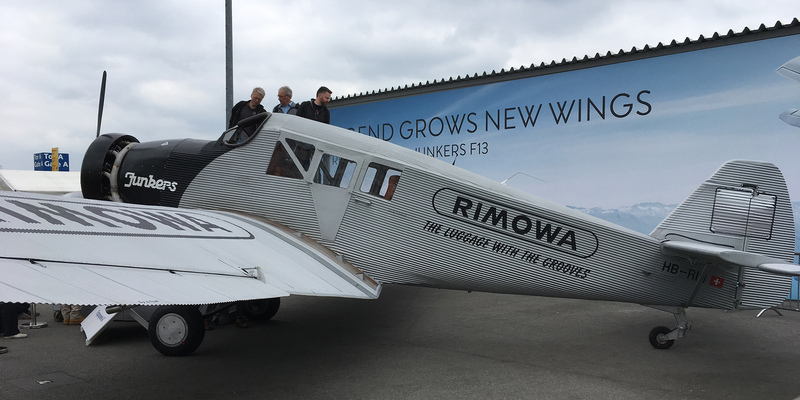 The Rimowa-Junkers F13 was undergoing flight testing in Switzerland in 2017, when it made an appearance at AERO. It is expected to eventually make is way to the U.S. For true aficionados of craftsmanship and durability, Rimowa has announced the anticipated manufacture of a limited number F13 replicas. A trip to AERO and Friedrichshafen would not be complete without a stop at the Dornier Museum. It sits opposite the runway from Messe, though on the same side as the commercial air terminal. Like Count Zeppelin, the name Claude Dornier is synonymous with aviation in Germany. Dornier Flugzeugwerke created many civil and military aircraft including the astrologically named Comet and Mercury, the aquatic monikered Whale (a flying boat), and the telluric Flying Pencil. The company would go on to form many commercial partnerships with other aviation and space related interests, including U.S. firm Fairchild Aircraft. In true German form, the Dornier Museum does a meticulous job of chronicling the research, development and eventual production of many Dornier designs. 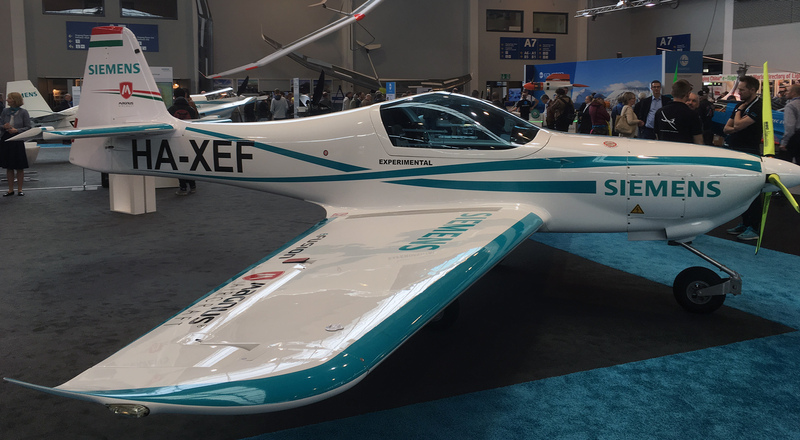 At AERO 2017 & 2018, Siemens presented the hybrid-electric Magnus eFusion, a unique electric powered aerobatic trainer with a diesel engine for recharging batteries while in flight. The aircraft was specially designed for UL, VLA and LSA markets and built by Magnus Aircraft in Hungary. Siemens is a storied company, one which includes an aviation past. The Siemens-Schuckert R.VIII was a bomber aircraft designed and built in Germany from 1916. Six 300-horsepower piston engines powered the massive biplane measuring over 150 feet in wingspan. The Magnus eFusion powered by a Siemens electric motor. In 2017, the eFusion was displayed alongside the world speed record setting Extra 330LE, also powered by a Siemens electric motor. The prototype eFusion, and its two occupants, were lost is a crash in Hungary in May 2018. 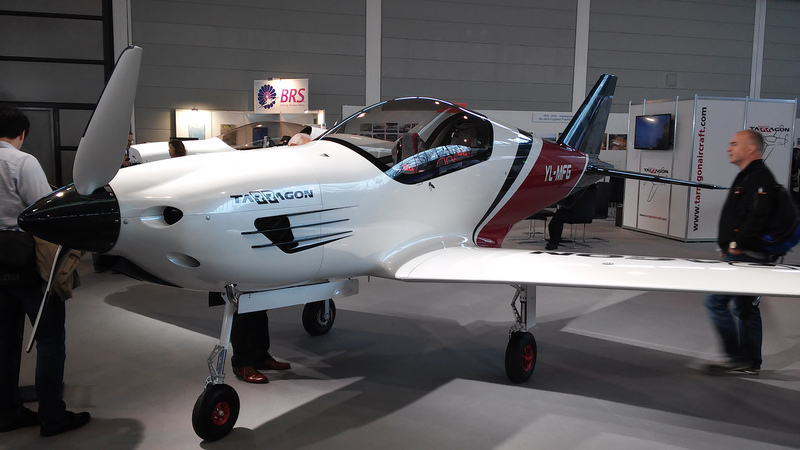 One month later, Magnus introduced the Fusion 212, a FAA approved S-LSA powered by a choice of three 100-horsepower engines from Rotax and UL Power. 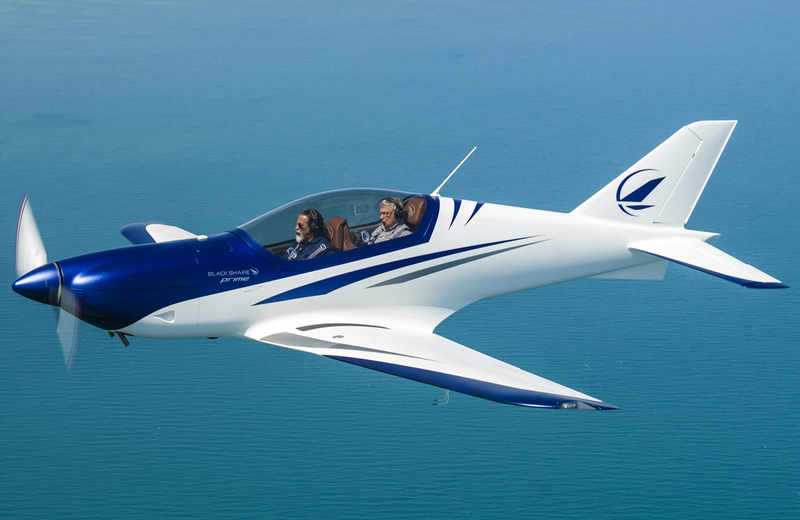 The composite fuselage Fusion 212 promises cruise speeds of up to 130 knots and was designed for aerobatics, stressed to -3/+6g, with its large control surfaces. 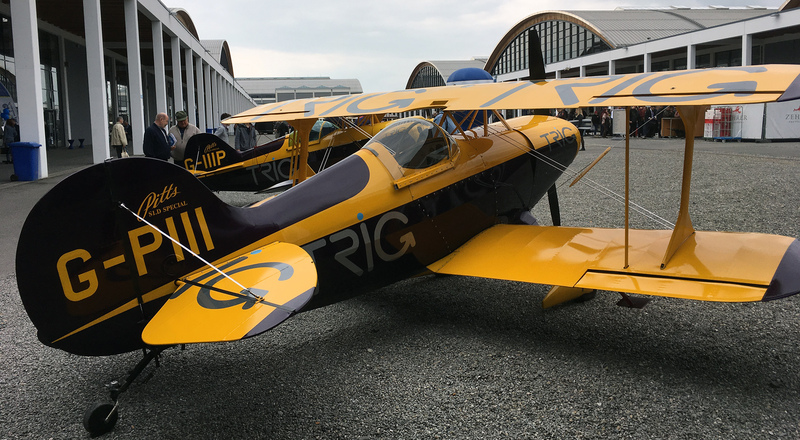 A pair of celebrities, two vintage aerobatic Pitts Specials were also on display at Aero 2017. The Pitts S-1D Special is a light aerobatic biplane designed by Curtis Pitts. The design first flew in 1944. Occupying one corner of the center courtyard at Messe were the diminutive twins. These German-registered aircraft form the Trig Aerobatic Team and have been performing exhibitions for years, primarily in the UK. Trig Avionics had its booth just inside the window. The Pitts S-1D Special operated by Trig Avionics. At AERO one can easily satisfy an itch for vintage and warbird aircraft. One might even open their mind to the modern world where digital instruments, lightweight production methods, and heavyweight regulations are redefining that which is old. There is certainly an abundance of warbird aviation on the horizon. It earnestly represents the past while managing to work in the present.